Returning Summer only students must complete a new Summer Session online application each year. Enrollment is a 3 step process. You are assigned an enrollment appointment time on WebReg. 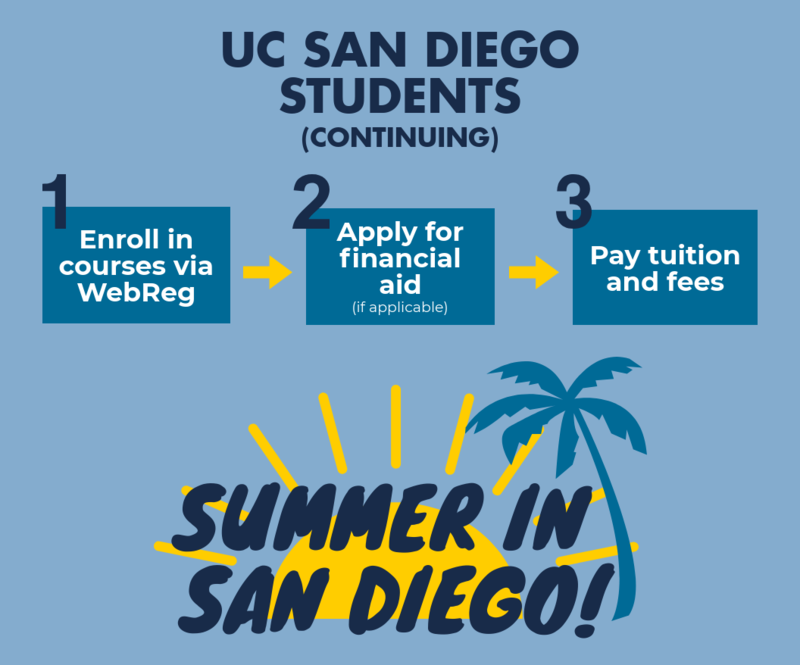 UC San Diego students can enroll directly through WebReg beginning April 15, based on your appointment time. Summer financial aid - new for 2019! No applications necessary. Simply enroll in classes as early as you can, and the Financial Aid and Scholarships Office will determine your eligibility and offer you financial aid for summer. Questions? Contact the Financial Aid and Scholarships Office at 858-534-4480 or email finaid@ucsd.edu. Pay tuition and fees. If you do not pay for your courses by the fee deadlines, you may be cancelled from your courses. Please refer to the Calendar for important deadlines. Financial Aid students: you may not be dropped for nonpayment, which means if you forget to drop unwanted courses, you may receive a grade of "F" for non-attendance and be billed for the courses. Accept your offer of admissions before the deadline. Be sure to complete all requirements on your checklist. Activate your Summer Session enrollment status (log in with student ID and password). Complete the Academic Integrity Tutorial. Questions about the tutorial? Contact Academic Integrity Office by phone (858) 822-2163 or email aio@ucsd.edu. Have to enroll in courses with prerequisites? Submit an EASy request. Use the Account Lookup Tool with Educational Technology Services. If you do not pay for your courses by the fee deadlines, you may be cancelled from your courses. Please refer to the Calendar for important deadlines. Enrollment for Summer Session begins April 22, 2019 for visiting UC students. Please note: Transcripts from UC San Diego are automatically sent to your home UC campus at the end of the summer term. All UC San Diego courses are for UC credit and calculated into your UC GPA. Talk with your home UC advisor about the courses you can take. Starting in March, browse the Schedule of Classes on TritonLink for the Summer course offerings. 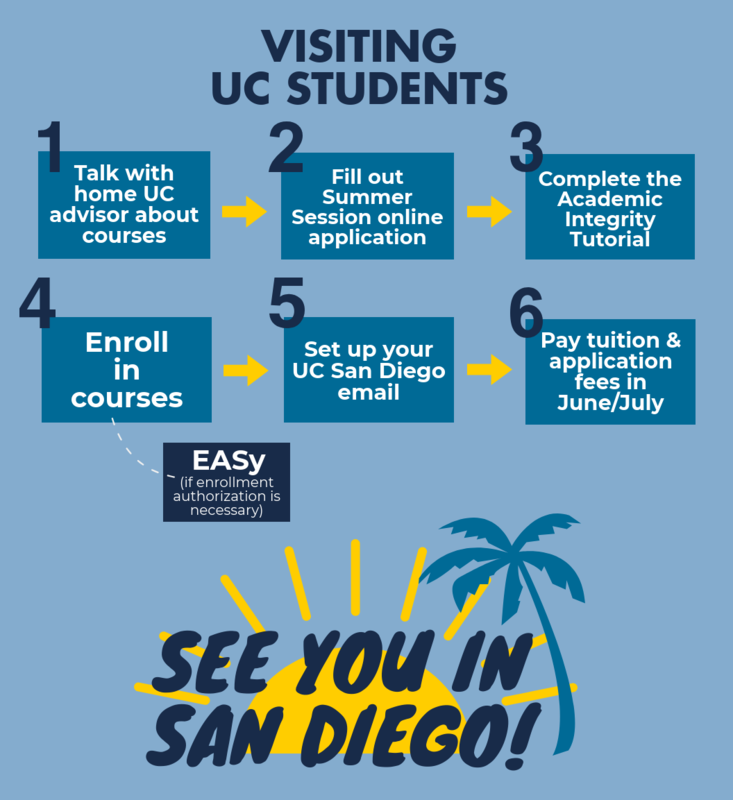 Contact your academic advisor to confirm that your home UC campus will accept course credit from the course(s) you wish to enroll at UC San Diego. NEW to Summer? Begin the process by requesting a student ID. Keep track of your student ID and password. You will need it to make changes to classes, order transcripts and pay your bill on TritonLink. RETURNING from last summer? Log in and complete the Summer Session online application. If you have forgotten your student ID, please call Summer Session (858) 534-5258.
if you have your student ID, but don't remember your password: use the Password Change tool. You will be charged a $50 nonrefundable application fee with your tuition. If you change your mind and no longer wish to enroll with UC San Diego, you are still responsible for paying the $50 nonrefundable application fee. How to enroll in courses with prerequisites? Submit an EASy request. High school students currently in grades 9 to 11 must have parental consent prior to applying to Summer Session. Students must maintain a minimum 3.3 GPA. All courses taken are for UC credit and will be calculated into your UC GPA. High school students currently in grade 12 are not considered in this category since you will have graduated from high school when Summer Session begins. If you are an international high school student, please email Summer Session summer@ucsd.edu for eligibility. Housing on campus is only offered to students age 17+. Talk to your high school counselor or teacher about which courses to take. Starting in March, browse the Schedule of Classes on TritonLink for the Summer course offerings. 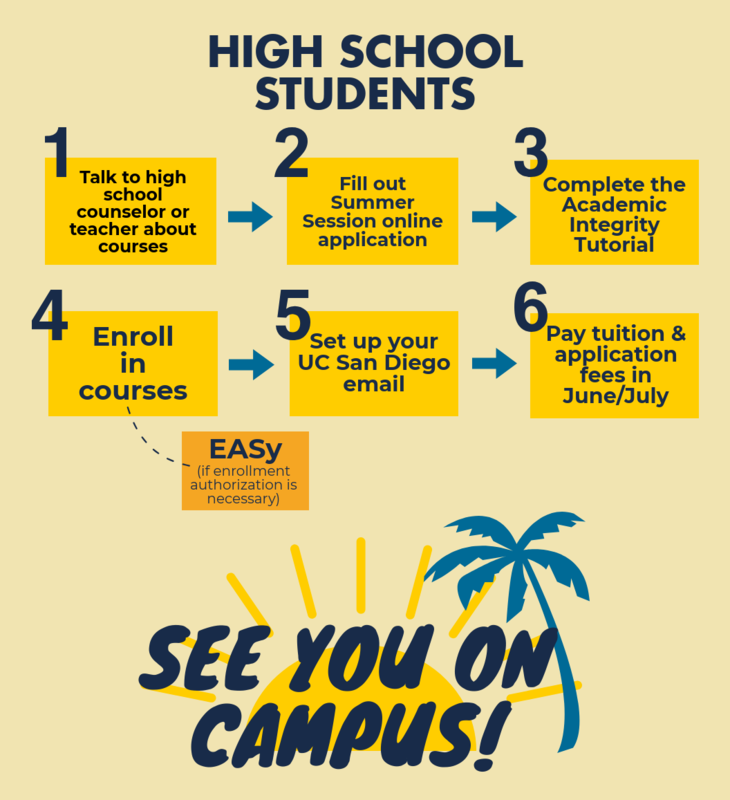 Inform your high school counselor/teacher that you intend to enroll in Summer Session at UC San Diego. You may wish to discuss what this means to your high school curriculum, future AP courses, and college/university application. High school students are allowed to enroll in lower-division courses, which are courses numbered 1-95 (ex: ECON 1 or MATH 20C). Please review all course prerequisites. If you have forgotten your student ID number, please call Summer Session (858) 534-5258.
if you have your student ID but don't remember your password: use the Password Change tool. You will be charged a $100 nonrefundable application fee with your tuition. 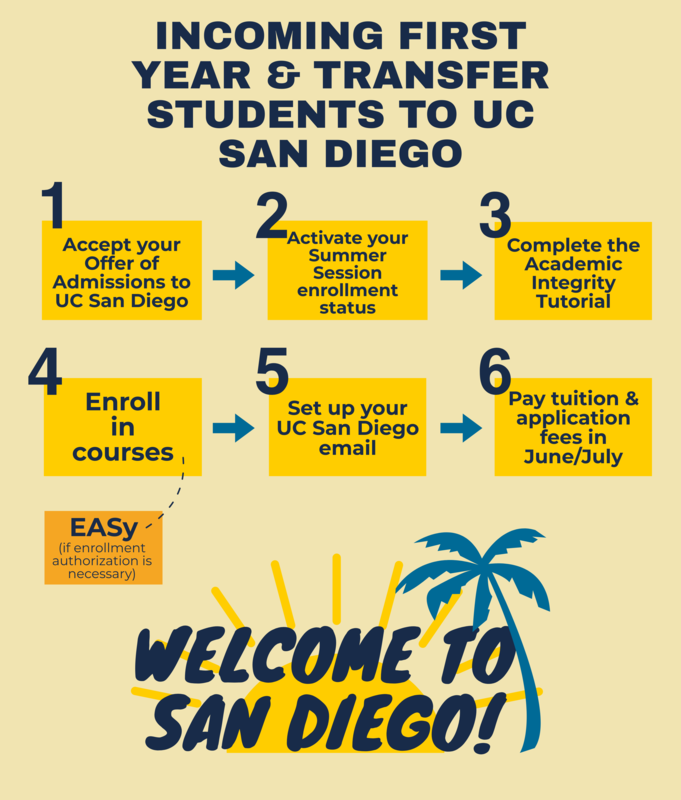 If you change your mind and no longer wish to enroll with UC San Diego, you are still responsible for paying the $100 nonrefundable application fee. Watch our webinar for more details on applying to Summer Session. Are you an undergraduate student currently studying in a university or college outside the United States? Starting in March, browse the Schedule of Classes on TritonLink for the Summer course offerings. Contact your academic advisor to confirm that your home institution will accept course credit from the course(s) you wish to enroll at UCSD. See instructions found on the International Students & Programs Office webpage. Skip this step if you are currently enrolled in a university or college in the United States. Questions? 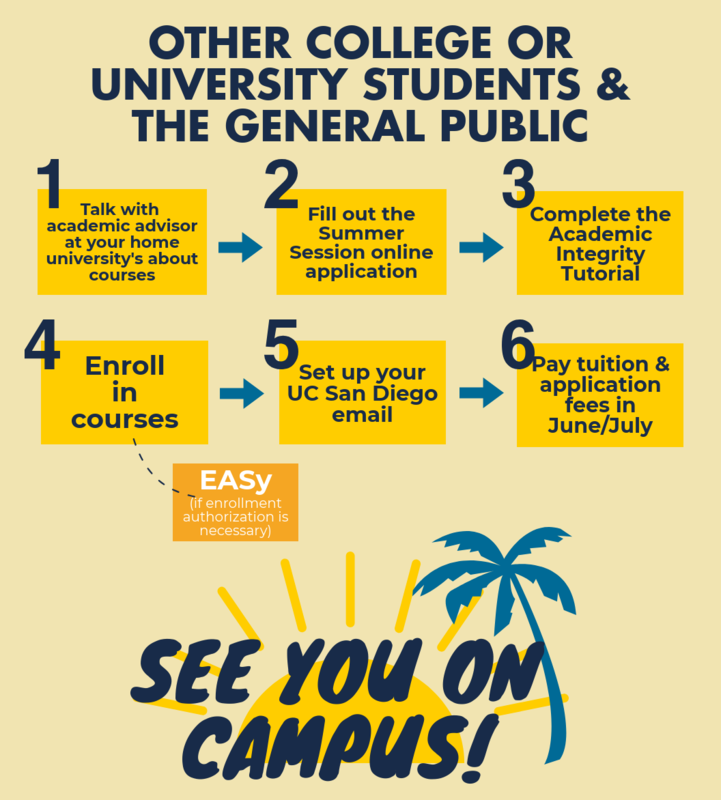 Contact the Summer Session Office at (858) 534-5258 or summer@ucsd.edu. *Please note that attending Summer Session does not entitle you to enroll at UC San Diego during other academic terms. 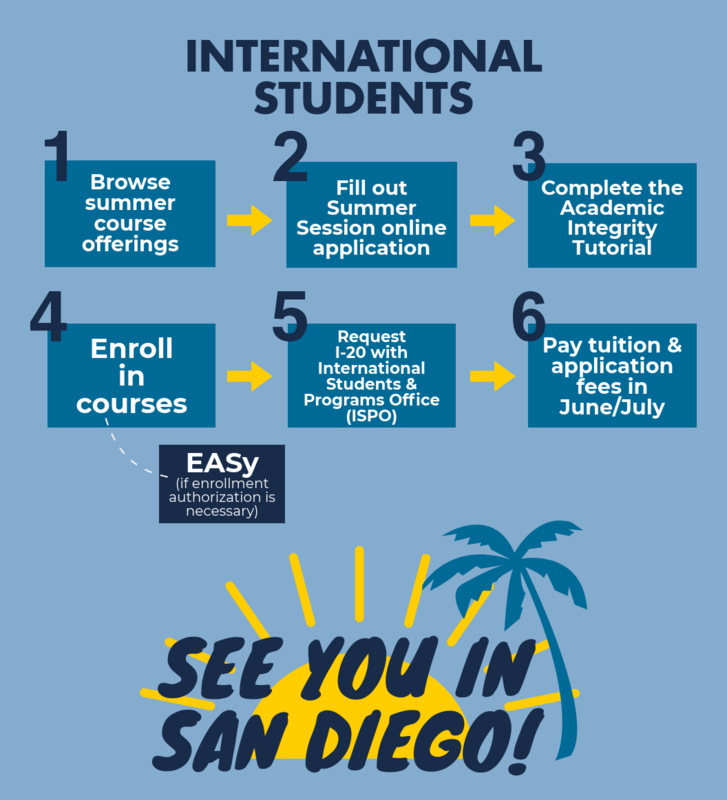 **If you are an international high school student, please email Summer Session summer@ucsd.edu for eligibility. Housing on campus is only offered to students age 17+. Enrollment for Summer Session begins April 22, 2019 for visiting students. Talk with your academic advisor at your home university's about courses. Enroll in courses via WebReg. Set up your UC San Diego email. Enrollment for Summer Session begins April 22, 2019 for UC San Diego alumni. Complete the Summer Session online application (log in with student ID and password).